Until the mid-1960s, the first two digits of a U.S. phone number were expressed as the first two letters of a name, such as JUpiter, MElrose, PLaza, MUrray Hill, PRimrose, etc. in order to make them easier to remember. Area codes were devised under the North American Numbering Plan (NANP) in 1947 in order to facilitate direct long-distance dialing, and area code 201 (New Jersey) was the first one implemented in the U.S., in 1951. I get more reliable service from my Verizon cell than I did with my AT&T landline. One time I had it go out for 5 days, took them forever to figure it out. Once it failed after an earthquake, but my cell still worked. And virtually every incoming call was a solicitor. The only reason I kept it was to call my cell when I couldn't find it, til I figured out that I could use Google on my desktop to make my cell ring for 5 minutes straight, even when it was on silent. And I like having an extra $40 or so every month that used to go to AT&T. phone companies have back up power so phones still work during emergancies. @notsteve -- Nope, I get my internet via my landline. And I still think landlines are more reliable than cell phones. Don't forget that there are still dead zones for cell reception in some parts of the US. I have a cellphone, but not a smart phone, and I don't carry it around the house with me. Heck, half the time I don't bother to take it with me when I leave the house. The only time I make sure I have it is on long-distance trips. @notsteve - I dunno... I don’t think I would like carrying my cell phone with me all over the house, and I would miss having extensions and the ability for other people in the household to be on the same call. Also, I believe that landline phones are more reliable in emergencies and power outages. And, to be clear, by “landline” I do not mean VoIP. With the advent of cell phones, isn't it time to get rid of your land line? With the advent of cell phones, isn't it time to get rid of long distance? I can understand it for international calls, but here in the U.S? My phone has an area code of 612 (Minneapolis area). My son has an area code of 701 on his cell phone. It seems silly that he can be standing in my kitchen but if I call him from my 612 number I have to dial 1 for long distance and I get charged for long distance. True, most cell phones have free long distance but those of us with landlines need to have a long-distance service plan. Hm. I know, I know. I'm a luddite. I don't go back that far; only to the mid 1960s that I can remember using the phone. Now what about when local calls crossed area code lines? No problem. Back then all locals had seven digits (or fewer). If you called from Needles and you had a girlfriend across the Colorado River in Mohave Valley, Arizona, you would simply dial 768-XXXX and she would dial you at 326-XXXX. I'm not sure if it would work if you dialed 112+602+768-XXXX. Now the Needles area code was also 714. And there was a (714) 768-XXXX. To get it you would have to dial 112+714+768-XXXX. People in Needles today probably think to dial that number as a local landline call as 1+928+768-XXXX is more complicated, dialing four more numbers. What is complicated today in Needles is that, despite still only having one prefix and a population of only 5,000 people, when we dial any number in the city on a landline phone we must dial 1+760+326-XXXX because of the 442 area code overlay on top of the 760. Every area code of my example phone numbers here has changed. 714 was broken off from the 213 area code about 60 years ago. It was 714. Then it was 619. Now it's 760. And maybe later we will see some action from the 442. I know in Michigan in the 50's and 60's in small towns, for local calls you only had to dial 5 digits. Our telephone number was 723-1323, but you only had to dial the last 5 digits. But it made a problem with people calling long distance to Flint, Michigan. The area code for Flint was 313, but if you didn't dial a one in front of it, you would call Owosso, where I lived. I remember at 3 years old in 1963, telling people "No, you have to dial a 1, then 313 and then your number." My mom worked for General telephone and she taught us that from the time we could talk. Concerning area codes... We're at risk of running out of them soon. Population growth, plus the advent of fax machines, mobile phones, and devices like the iPad that get assigned a mobile number for data purposes have used up all the numbers in various areas, so new area codes were created for the overflow, but there's only so many 3-digit area codes. 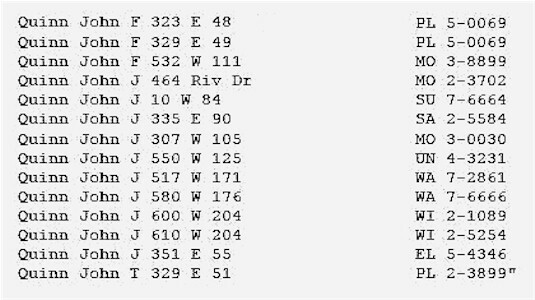 By the way, did you ever notice that the original area codes were assigned based on the number of phones in the area, such that the lower numbers (212: NYC, 213: LA, 312: Chicago, etc.) went to the largest cities? This was because those numbers could be dialed the quickest on a rotary-dial phone. Hawaii's area code, on the other hand, is 808. I have a modest proposal for how to deal with the large number of devices that need phone numbers. (For instance, there are three members in my family. We have two houses and a total of 10 phone numbers; 4 voice landlines, 2 fax/DSL lines, and 4 mobile devices, counting my iPad.) I suggest that households with several phone-type devices should be assigned one main 10-digit number, and that an 11th digit could be dialed to reach the other devices, kind of like extensions. If the 11th digit was not dialed within a short time, the call would be routed to the main number by default. Anyone see any flaws in this approach? Of course, it'd mean tons of software and database fields would have to be modified to accommodate longer numbers. Our number was GEneral 7-XXXX, and I DO remember saying "G E 7" and not "General 7". So I guess that varied. I still remember the pre-digit-dialing phone number of a friend I haven't called since I was 14. He lived in Great Neck, NY, and his number was HN 6-xxxx. Since the prefix/exchange letters were the first two of the name, and not the initials of a two-word name (e.g., Murray Hill was MU, not MH), I've never understood where the HN came from.